We are now "full time" in our travel trailer and likely will be for some time, likely years. Snowbirds, winter in the southwest and winter in the Pacific Northwest. I put my large shop tools in storage so I won't have those on the road. Can't imagine not having some form of hobby shop so I've decided to innovate. A few years ago I bought a fairly complete Sherline shop mainly for the lathe. I wanted to convert this to CNC to learn about a CNC lathe and see if it is useful in the hobby shop. I did this conversion and the lathe works well. I'm learning abut it. Starting with the CNC lathe I added a CNC milling column. This gives a combination lathe/mill that is quite compact. The column base mounts to the lathe bed just as the spindle does. It's just like the standard milling column and the spindle mounts to the column slide just as it does to the lathe bed. Converting from lathe to mill, or mill to lathe, takes maybe 2 minutes. That is without truing anything, but for many things it's likely OK. The keys should keep it reasonably straight. Not the whole story as you can't leave the vice on the mill while doing a little lathe work. So you have to re-true the vice, etc. 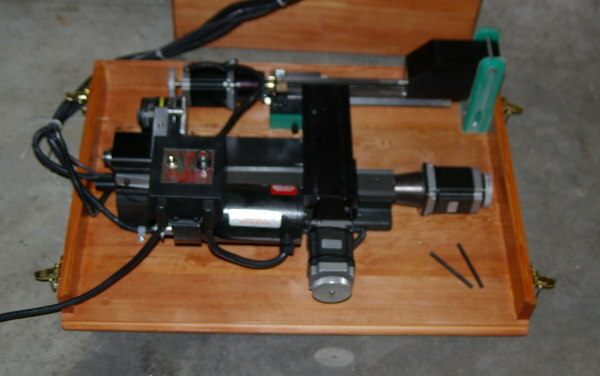 The CNC conversion is stock from Sherline and was easy to implement. The only addition is an encoder on the spindle. The controller uses a Gecko G540 controller with home rolled power supply. A mini-ITX computer is used via the parallel port to the G540. I'm using LinuxCNC for controller software. 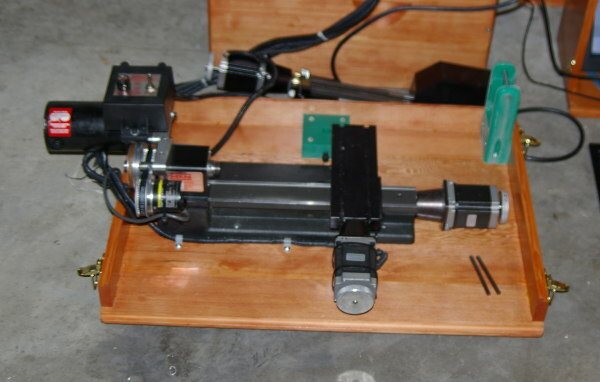 LinuxCNC, with the spindle encoder, allows lathe threading. Using the system the first thing I discovered is the lathe cross slide has a travel of a little over 2.5". OK for lathe but a little skinny for milling. I found that Sherline offers an 8" table for just this reason. That increases the milling envelope from 2.5" to 4.5". I added one and it's much more reasonable. The throat of the mill is fairly small also. But not to fear, Sherline makes riser blocks to increase this 1" or 2". My tooling included the 1" block and I've obtained the 2". I built boxes for the Traveling Sherline Show. They are from hemlock with simple biscuit joinery. 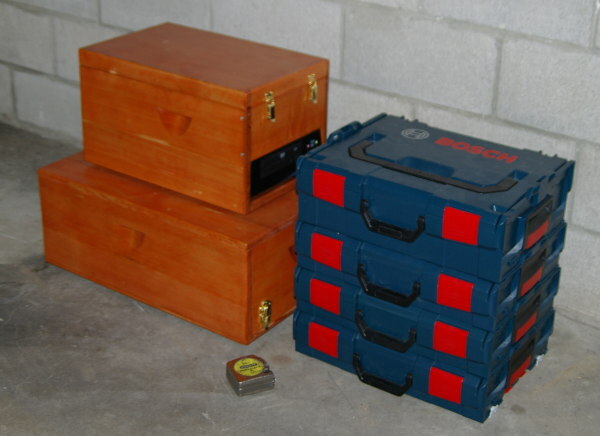 The results will work well, not quality furniture finish but OK. Below is a pic of the two boxes and toolboxes with, duh, tooling in them. The tape measure is there for scale. The large box is the Sherline lathe/mill. 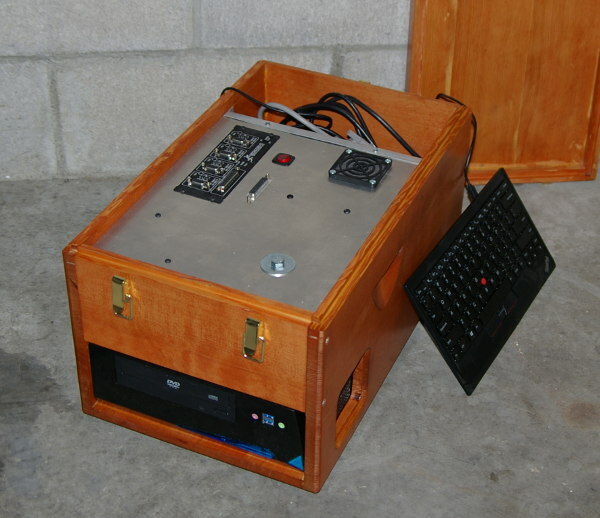 The small box is the controller, computer and driver power supply. The machine and controller opened up are shown below. A small LCD monitor is stored in the lid of this larger box. The lathe/mill are below in traveling configuration. Here the head is turned 180 degrees for a more compact package. 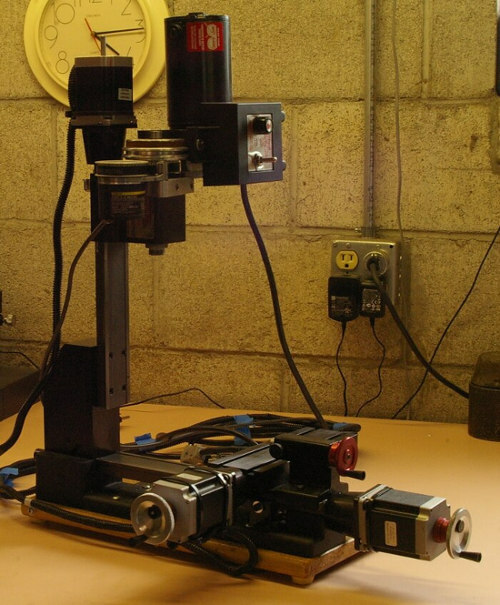 It looks like the below once the head is turned the right way and the milling column moved out of the way. The controller box has the mini-ITX computer and CNC driver hardware. As above the main driver is a Gecko G540. The rest of the space contains the power supply and storage for wires, etc. The keyboard and mouse fit inside the box on top of the controller. 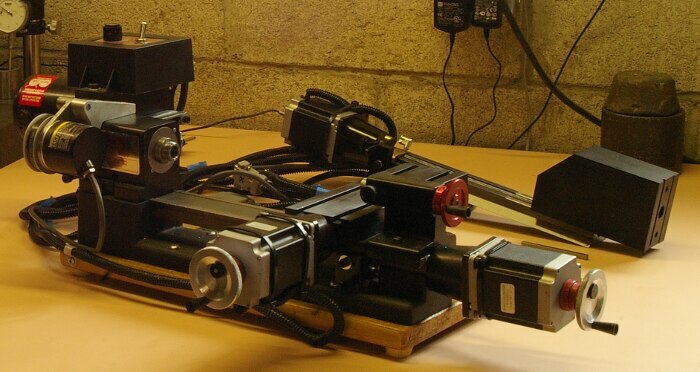 The shot below shows the system set-up, wired and ready for use. The unfolding is fairly quick. However, getting it all out of the car, including the tooling, takes some time so full set-up will take 45 minutes or so. 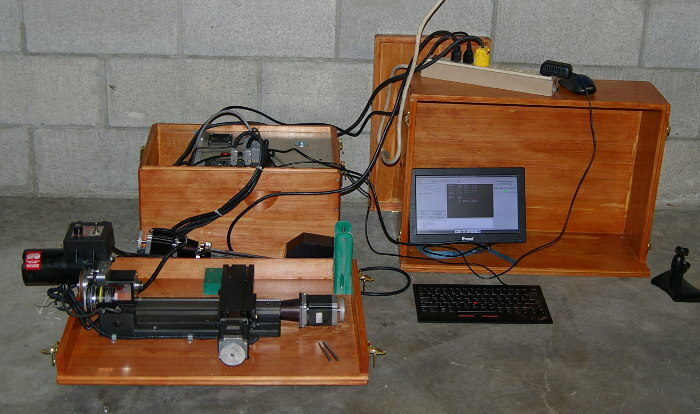 The computer is running a standard version of Linux-CNC. One configuration for lathe and one for milling. 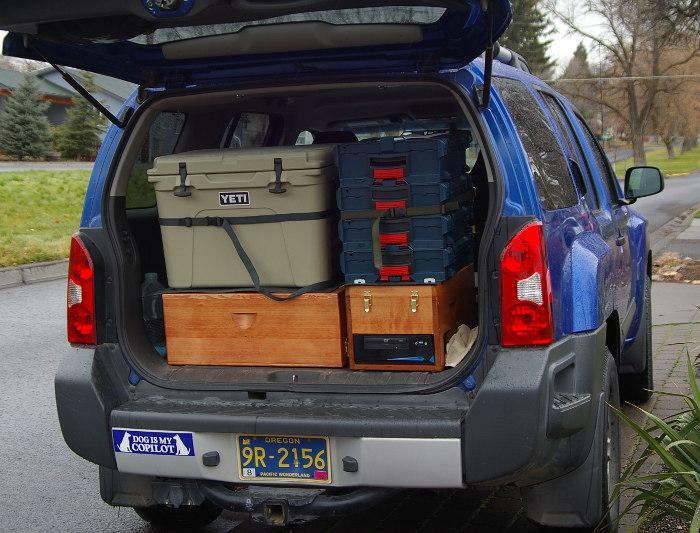 Here's a pic of the Show loaded into our X-Terra. A lathe/mill isn't a lot of good without associated tooling. So the Bosch L-Boxes hold all the tooling I could cram into them. Most of the tooling below are from the purchased Sherline shop. Tool Holders - I've made several end mill holders. Soft Jaws - Using Sherline master jaws I made a few soft jaws for my 3 jaw chuck. QCTP - I had trouble with my QCTP slipping. I made a plate to hold it square to the cross slide. Vice - From a design by Try Ally Tech I made a low profile vice for the Sherline. Backside Cutoff Holder - This describes a cut off tool holder for the backside of a Sherline lathe. Tailstock Die Holder - I made a lathe tailstock die holder using plans from Clickspring. Boring Head - I've had trouble using Sherline's boring head. So, I found a small Centurion boring head and make a mount for the Sherline spindle. ER-20 Chuck - This describes an ER-20 chuck for the Sherline lathe. Tap Guide - Tapguide used in the mill to hold taps square. Tramming Tool - A simple bracket to hold a dial indicator for tramming the Sherline mill. Tooling Plates - Describes some tooling plates for use on the Sherline mill. T-Nuts - New T-Nuts for the Sherline mill. Fly Cutter - Describes a large diamter fly cutter for the Sherline mill. I've found that chips (schwarf) are more of a problem that I'd anticipated. 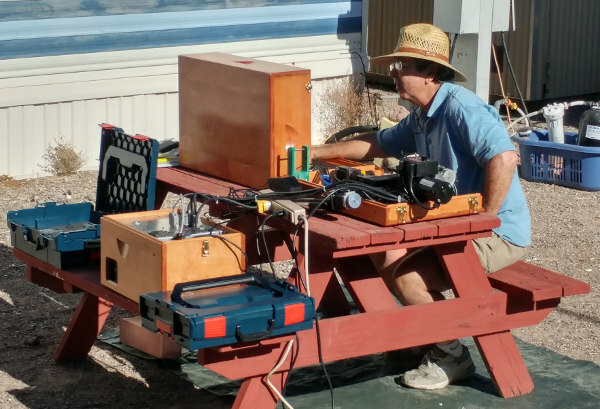 The Sherline Lathe can spew chips way beyond a meager tarp under the table. I've obtained a "sun canopy" with solid side walls. A large tarp extending beyond the "tent" walls should contain the chips fairly well. 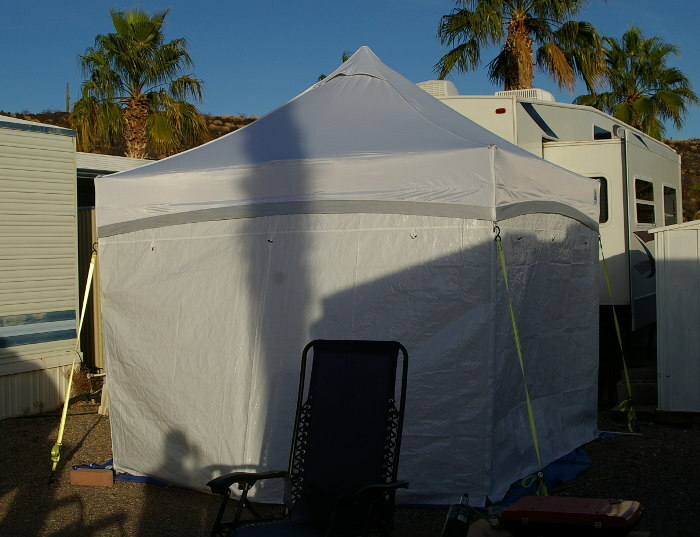 The tent measures 10' x 10', more than big enough for the Travelling Show. A canopy also helps with set-up. It takes some 45 minutes to set-up and 1+ hours to put away. So any machining, including set-up, takes all day. 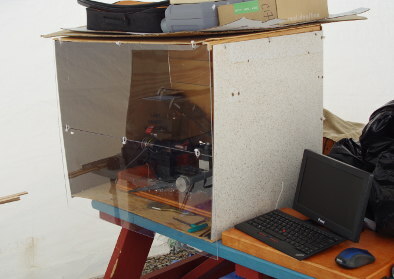 A canopy allows the set-up to remain allowing an hour or two of work at a time. But using the machines requires a permanent camp, a few weeks or more at a time. An enclosure was suggested for chip control. 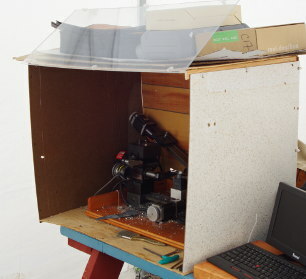 A plywood box held together with zip-ties and a lifting plexi front door. I decided to try making one. It seems to work well. If not needed the front bi-fold door can be left open for better access to the machine. Not sure if a coolant/oiler will be needed down the road since access while machining is limited, when chips are flying. The zip-ties are cut for travel mode, then it lays flat. The one in the picture is just a trial, made of dumpster diving chip board. Likely throw it away, keeping the plexi, and make a better one from thin plywood. It's proven itself enough for the next version.